"If there is a most vulnerable time for a church, it is when it is under construction because we get people who are using torches or welding or cutting, that are of course sources of ignition, to set the wood roof structure on fire," Corbett said, noting that the interior of the Paris cathedral was covered in scaffolding when the fire began at about 6:50 p.m. local time on Monday, near the start of Holy Week. In 1998, Central Synagogue, a national and New York City landmark, was heavily damaged in a fire that resulted from a construction worker's blowtorch during renovations. The roof and its supports were destroyed in the fire. 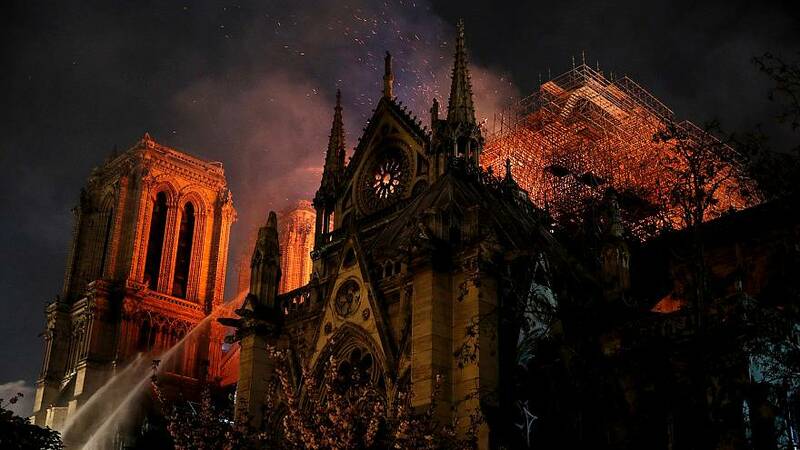 On the other hand, the collapse of Notre Dame's roof in the blaze could help firefighters by "putting the fire closer to them rather than up in the sky," he said. "Once the roof is consumed, all that burning debris is going to fall at the floor level and of course, everything that's down there will be on fire," Corbett said. "Fortunately, for Notre Dame, I'm sure they've got deeper pockets to rebuild this church," Corbett said. "But there are a lot of churches that, if they lose their building, that's it."